This is the most common poisonous snake in the Natal Drakensberg and is found on rocky mountain slopes at all altitudes, even the escarpment. It has a relatively narrower, longer head than the Puff Adder, is more lightly built, and has a much more patterned appearance, this consisting of two longitudinal light bands between which lie two wavy patterns joined at the middle. Below the longitudinal bands are some pale spots. The Berg Adders most commonly encountered are nowhere near the above lengths – 10 to 20 cm is a much more representative size. These younger snakes are dark grey to black, with light grey patterning. The rarer, larger adults may be dark brown with yellow / fawn patterning, and can become fat enough to be mistaken for a Puff Adder although the two species are very differently patterned. 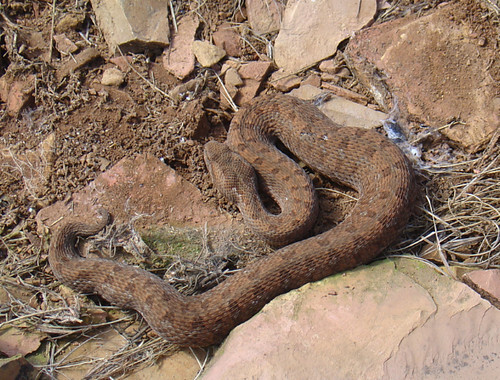 The Berg Adder is responsible for the most bites amongst hikers and climbers, since it is in the habit of sunning itself on small rock ledges as well as paths. Many of the recorded bites have been to the hands and fingers, inflicted as hikers and climbers have attempted to clamber up steep slopes using ledges as hand-holds. It is a very irritable snake and is easily provoked into biting, although it prefers to escape from danger while making a loud hissing noise. Very small specimens hiss with such considerable vigour that their whole body vibrates, and it sounds like they are squeaking.